Don't just get him the usual box of chocolates or bottle of whisky this year. We have literally hundreds of "man gifts" on this site. Retail prices start at around £10 and go up to £240. Anything to do with drinking usually makes my father happy. 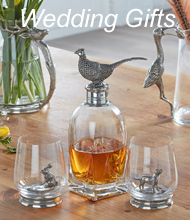 How about our polished steel pheasant corkscrew at £35.50 or a Black Labrador bottle stopper at £13.95. A nice animal themed pen would be a super and useful pressie. Our Pheasant pen is £13.95 gift boxed. We have a horse pen, stag pen and black labrador pen. To make your search easier, we have only put items in this category that are in stock at this very moment. Although, sorry if there is a sudden rush on one certain item and it runs out quicker than we have chance to restock.